If you work in the medical field then you will come to rely on your medical equipment in order to make accurate diagnosis and to properly treat and help your patients. Good quality medical equipment makes a world of difference in the type and quality of medical care your patients enjoy from you. Unfortunately you cannot buy every piece of modern medical equipment available on the market and doctors often perform miraculous procedures with minimal medical gear. But the one piece of equipment that no medical professional can go without is a stethoscope. A stethoscope is a basic must have whether you are a nurse or a highly trained specialist. This tool allows you to hear all of those inaudible sounds in your patient’s heart and gastro system so you can identify problems such as heart conditions, lung problems and so much more. There are lots of terrific stethoscopes and brands available on the market but the Littmann stethoscope brand is one of the best devices you can possibly choose. Littmann is known for providing high quality stethoscopes and this particular brand is particularly popular because they have such a huge line of different stethoscope types available. You can buy a simple stethoscope for general medical practices which is perfect for nursing or select a specialized stethoscope that allows you to hear the highest or lowest frequencies of heart sounds which is perfect for cardiology patients. 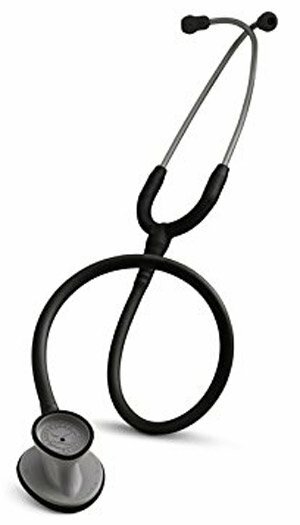 Littmann also have stethoscopes in different price ranges so med students to qualified professionals can all enjoy the benefits that the Littmann brand has to offer all while maintaining great status and a great overall look thanks to the beautiful design and fun colors of these fine quality stethoscopes. The first thing you need to do is consider the line of work in which you are performing. Are you still in medical or nursing school? A simpler and more affordable stethoscope might be best because you don’t quite know what type or features you will prefer or use the most in the future. Are you in general care? Nurses often find that basic stethoscope types are better for monitoring vitals. Do you work with children or adults? Not all stethoscopes are suitable for infants. You need a stethoscope with an open bell in order to check these tiny patients. If you work in both lines then it is best to choose a stethoscope that is suitable for infant to adult patients. Where do you specialize? 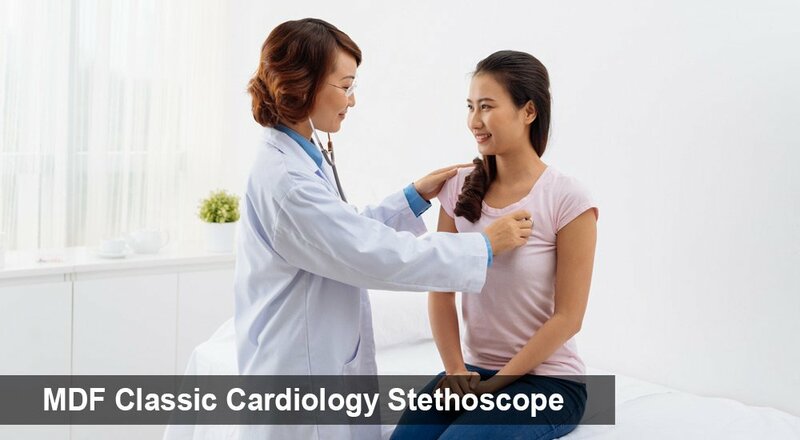 Cardiology professionals tend to prefer a cardiology stethoscope because it allows them to hear high to low frequency sounds of the heart where other types of stethoscopes might be better for hearing gastro sounds. Do you work in a practice or in the ER? Medical professionals in the ER frequently work with trauma and high risk patients which means they need a stethoscope with more features. These medical professionals also tend to be on their feet a lot more and need something lighter. Those working in a practice tend to hang their stethoscopes in the examination ward and weight usually isn’t an issue. Are you hearing impaired? Medical professionals with hearing problems prefer electronic stethoscopes because these can be set at greater amplifications so you can hear better. The type and level of acoustic performance your stethoscope gives can make it easier to hear different sounds such as the heart, lung, stomach or all sorts of thrills and murmurs. 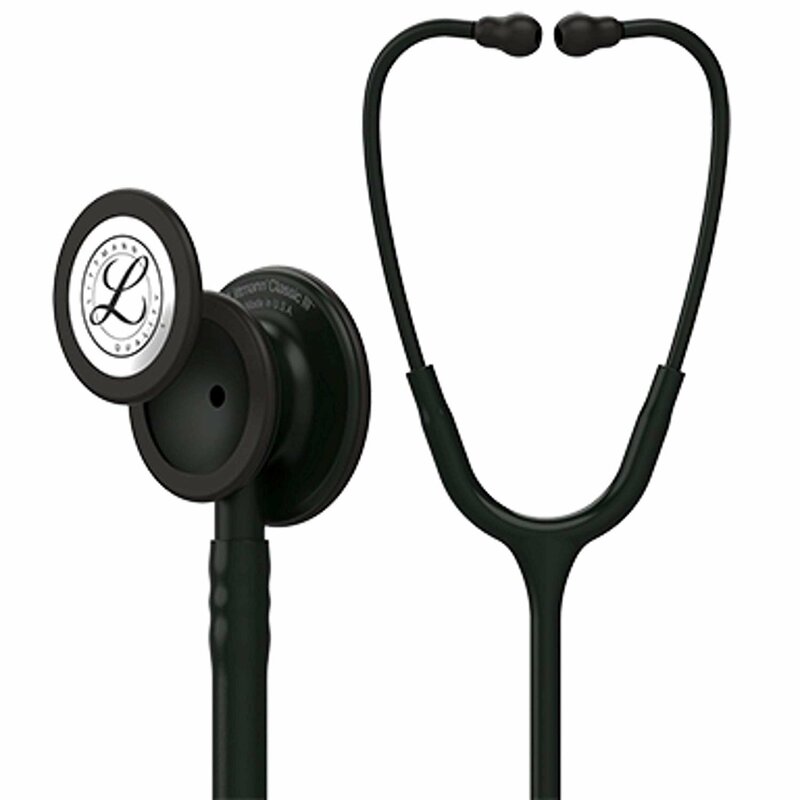 The Littmann brand is particularly preferred because of these stethoscopes high acoustic performance ratings. These stethoscopes are made with dual lumen tubing that blocks out external sounds and allows medical professionals to hear a lot more clearly. Littmann’s electronic stethoscopes are preferred for high performance because it gives greater amplification. Some of their non-electronic stethoscopes are also brilliant while other more basic models don’t offer quite as much clarity on soft sounds. You need to determine the kind of features you will mostly use in your line of work. Littmann’s stethoscopes comes with all sorts of features such as electronic, non-electronic, single or double lumen tubing, single or dual sided chest piece and more. The more features your stethoscope has the more expensive it becomes. Some stethoscopes even offer visual displays, assessment recording, sound amplification, a greater frequency range and much more. Consider the features you need and then choose according to these functions. Littmann isn’t the cheapest stethoscope on the market but they do have quite a few affordable devices on the market. Their budget friendly range is exactly why you see so many medical and nursing students walking about with these fine quality devices. The affordable range varies from $30 - $50 but you can easily end up dishing out up to $300 for a modern electronic stethoscope with lots of features. Consider your budget because in the end this could be one of the biggest factors that affects your choice. For many medical students and even medical professionals a more affordable stethoscope is better because these devices can easily get lost, misplaced or stolen. Some stethoscopes have a much greater variable frequency level. For some medical fields such as nursing this variable frequency level isn’t necessary because you just don’t use these other higher or lower frequencies for monitoring patients. For some lines of work such as cardiology, a high to low frequency stethoscope is very important and could mean the difference between life and death for your patients. These stethoscopes are not just some of the best on the market but are the top picks for different work environments. The Cardiology IV is preferred for cardiology and high performance work, the Classic III is preferred for general wards and the Lightweight II is preferred for diagnostic and physical assessments by nurses who are constantly on their feet. There is a more advanced cardiology stethoscope - the Master Cardiology with acoustic level of 10 out of 10 - But we didn’t rule this one as a top pick because it has a single sided chest piece. It does come with special procedures for neonatal or pediatric patients but is preferred for adult patients. 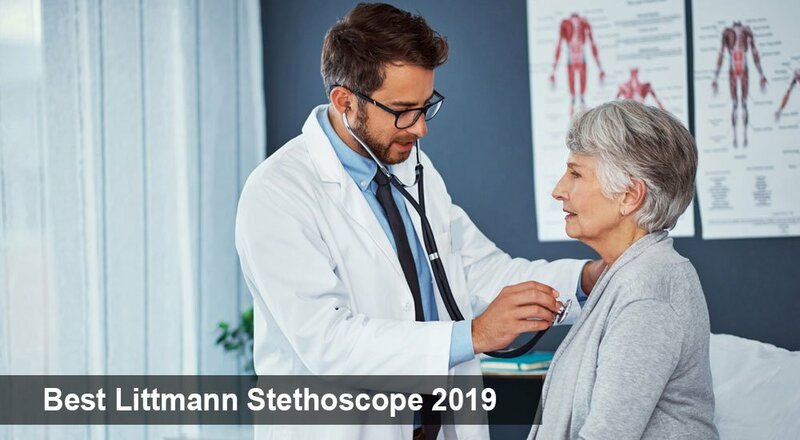 Now that you understand more about the different types of stethoscopes available on the market and the different uses for these stethoscopes, it is time for you to find out what the top 10 Littmann stethoscopes are. Here are the best picks for these superb stethoscope types. This is one of the best stethoscopes that healthcare professionals can buy. The stethoscope offers an acoustic level of 9 out of 10 and is ideal for studying cardiac, lung and gastric sounds in pediatric to adult patients. It is an excellent piece for those in cardiology and high performance or emergency work areas. The stethoscope, like all other Littmann stethoscopes, is beautiful in design. It is available in 9 different colors and 7 different styles. The look and design of these stethoscopes are sure to lend you plenty of style and will certainly enhance status as you go about your work. The stethoscope is made of fine quality materials. It has next generation dual lumen tubing that eliminates rubbing noises and that is resistant to staining. The chest piece is made of machined stainless steel that is oil and alcohol resistant. You can use this stethoscope to pick up high to low frequency sounds by adjusting your pressure on the chest piece. It is fitted with single-piece diaphragms that are tunable on both sides and at just 169 grams this is a nice and light anti-fatigue stethoscope that is perfect for those bustling days on the job. The chest piece has a deeper bell than the Cardiology III that enhances acoustics and the piece is fitted with an open bell that is perfect for treating pediatric patients. 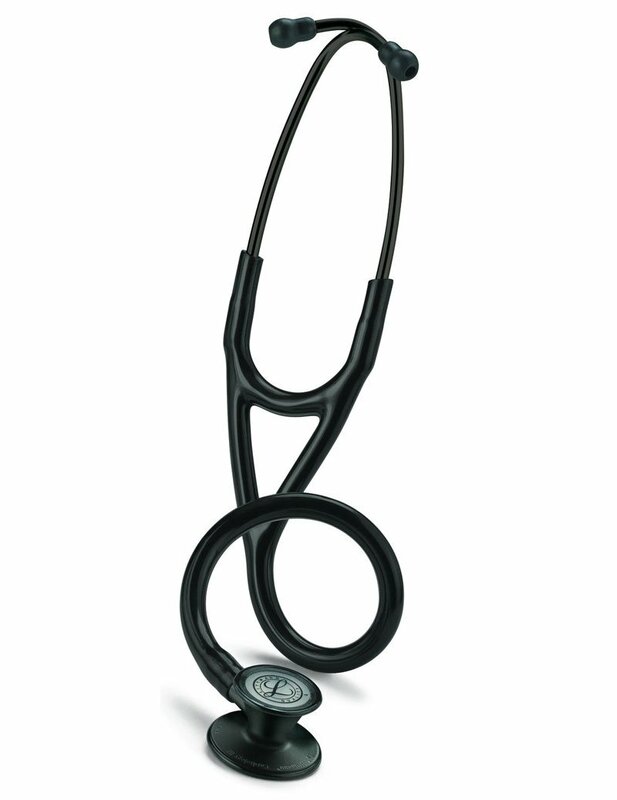 The Littmann Classic III is the best stethoscope in the classic range. It is a perfect stethoscope for general physical assessments and diagnosis and the tunable diaphragm and double sided chest piece makes it convenient for treating infant to adult patients. The stethoscope is very stylish since it has a very pleasing design and it is available in 25 different colors and shades. The variety of shades makes it perfect for creating a unique look for yourself so you can stand out from other medical staff. The stethoscope is made of durable materials. The chest piece is made of stain resistant stainless steel and the next generation tubing is 100% latex free which is preferable for patients with latex allergies. The Classic III has a double sided chest piece and is fitted with a single piece diaphragm that is tunable on both sides. It has an adjustable headset tension and comes with spare snap tight ear tips in different sizes. It weighs only 180 grams and is available in different tube lengths of 56 and 49cm. The pediatric side of the chest piece can be turned into an open bell by replacing the diaphragm with a non-chill rim. This is a very popular stethoscope amongst nurses and med students. 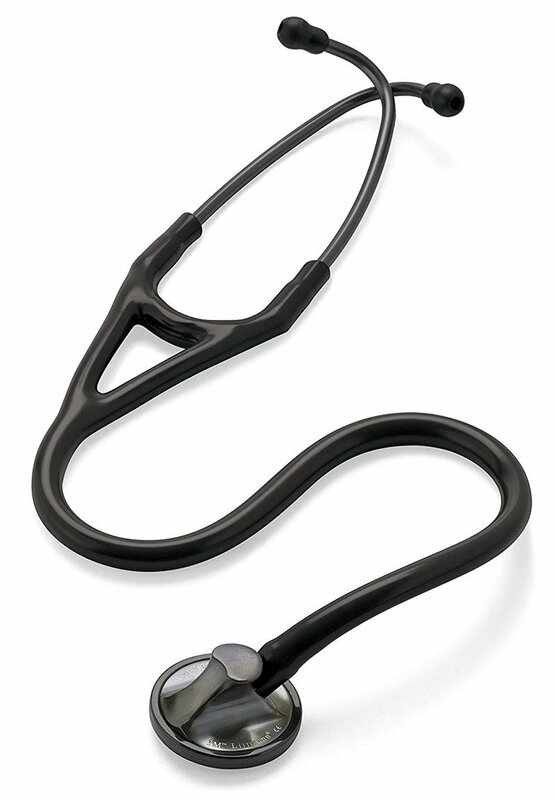 At just 118 grams it is one of the lightest stethoscopes in the Littmann range - hence the name. The stethoscope is also remarkably affordable which makes it perfect for bustling nurses who might be constantly misplacing their medical equipment. You can easily replace your stethoscope without breaking the bank or invest in various colors to match every uniform. The stethoscope has a tear-drop shaped chest piece that fits comfortably under the cuff for easy blood pressure monitoring. It is also available in 7 different colors. 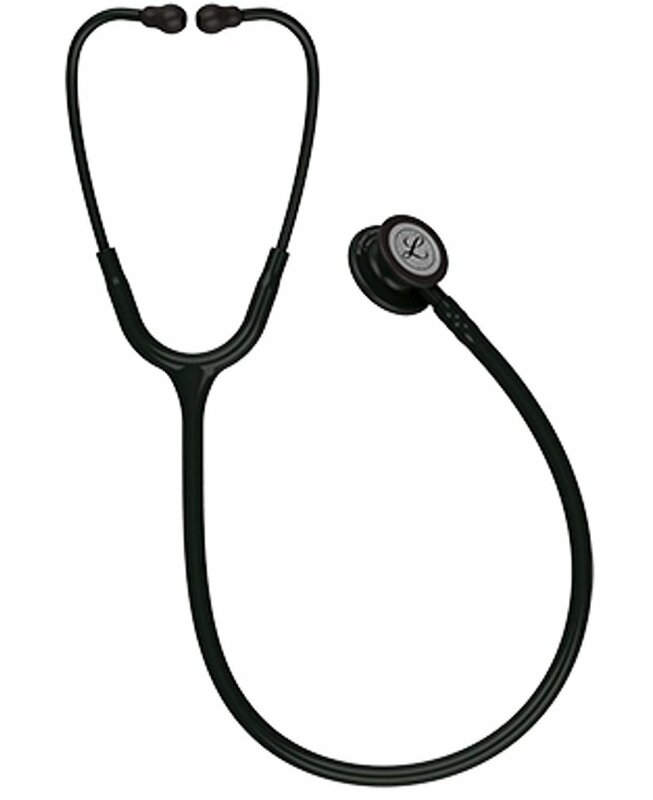 Like all other Littmann stethoscopes, this one is also made of durable material. It is fitted with latex free next-generation tubing and the chest piece is made of metal and resin composite. The Lightweight II features a single diaphragm and has a double sided tunable diaphragm; it has single 71 cm long lumen tubing and comes with an optimally shaped headset and soft sealing ear tips. If you are looking for a stethoscope with outstanding acoustics then the Master Cardiology is the right pick for you. This stethoscope has a 10/10 acoustic performance and is a perfect pick for those working in cardiology or in high performance work areas. The stethoscope has an overall great look. It is available in various colors and different chest piece finishes with a simple and sleek overall look. The Master Cardiology is made of high quality materials such as next-generation latex free tubing with polished stainless steel chest piece that is stain resistant as well as anodized aluminum headset. This stethoscope only has a single sided chest piece but does come with special procedures adaptor for treating neonatal or pediatric patients and is fitted with a non-chill rim. It also has two-in-one tube design that eliminates noises of tubes rubbing together and has snap tight soft sealing ear tips. It features a patented tunable diaphragm that alternates between low and high frequency sounds by adjusting the pressure on the chest piece and is specially designed for peak performance. The Littmann Classic II is also a superb stethoscope to consider although it is becoming scarcer on the market because the Classic III is the upgraded version that replaces this stethoscope. The Classic II is perfect for general physical examinations and diagnosis and as such is great for various medical professionals and med students. The stethoscope, like its upgraded version, has a beautiful design. It is available in 9 different colors with various chest piece finishes and will certainly lend you plenty of charm. The Classic II is made of next generation single lumen tubing that is 100% latex free. It is also fitted with a single sided plated and polished alloy chest piece that is stain resistant. At just 160 gram it is a rather light stethoscope and it has a tunable diaphragm. The biggest difference between the Classic II and the Classic III is the fact that the Classic II has a thinner bell and as such isn’t as acoustically terrific as the Classic III. The II is preferable for listening for a wide range of sounds while the III picks up heart variations a little bit better. This is another great cardiology stethoscope. The Cardiology IV is the upgraded version of the Cardiology III and as such isn’t as easy to find in stores as the Cardiology IV. But if you do have this stethoscope then rest assured that you have a quality device that is perfect for cardiology and high performance work environments. The Cardiology III has a beautiful design. It is available in various colors and in different chest piece finishes and looks a lot like the Cardiology IV. The stethoscope is made of next-generation latex free tubing and is fitted with a machined stainless steel chest piece. It has a double sided chest piece with a two-piece diaphragm that is tunable on each side. The latex free tubing offers dual lumen functionality and the stethoscope is nice and light at just 123 grams. These stethoscopes, like so many other electronic stethoscopes, are quite pricy. The Littmann Electronic is perfect for high performance work environments and reduces frictional noise to a bare minimum since it eliminates 85% ambient noise. It amplifies sounds up to 24 times which makes it a great pick for medical professionals with hearing impairment. These stethoscopes look just as great as all other Littman stethoscopes and are also available in a range of colors. You can easily spot it from other models by its different shaped electric chest piece. It is very durable since the chest piece is made of chrome, the diaphragm is made of polyurethane coated silicone and the headset consists of anodized aluminum. The stethoscope has bell and diaphragm mode, comes with snap tight soft sealing eartips, has a non-chill diaphragm cover and is made of single lumen tubing. It weighs only 185 grams and comes with a warranty. This is another one of Littmann’s lightweight stethoscopes. The stethoscope is perfect for diagnostic aids as part of physical assessments of patients. It is preferred by nurses, nursing assistants, nursing students and EMTs. The stethoscope looks pretty great. It is available in various colors and features modern looking design. 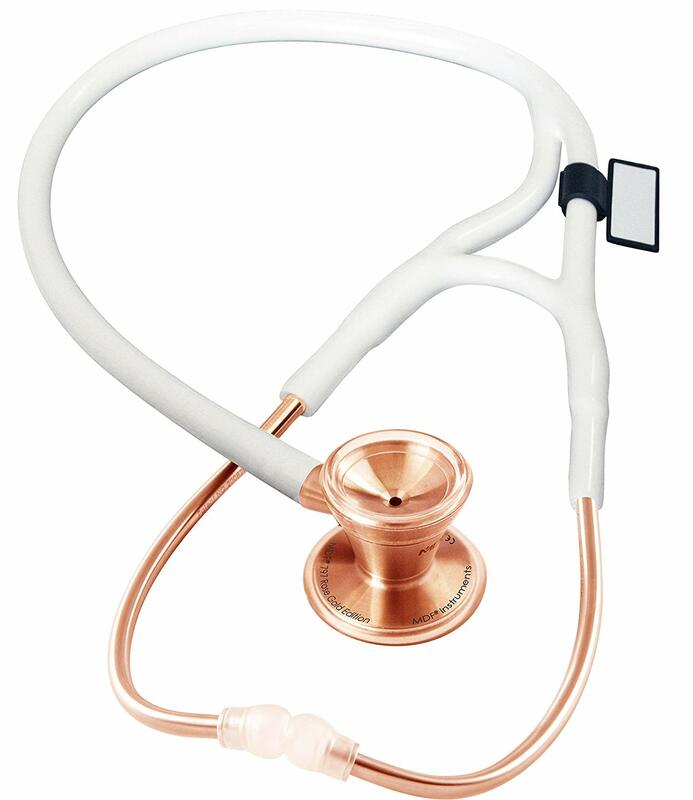 The stethoscope has a coated alloy chest piece, fiberglass or epoxy diaphragm and has anodized aluminum chest piece. It has a portable convenience single sided chest piece with a comfortable angle. It is fitted with single lumen tubing and comes with a tunable diaphragm that allows you to alternate between bell and diaphragm mode without having to turn your chest piece over. It only weighs 120 grams which is perfect for busy nurses who are on their feet for the biggest parts of the day. If you are constantly working in the neonatal division then you absolutely need the Classic Infant stethoscope. This stethoscope is perfect for treating infant and pediatric patients and is preferable for pediatricians, neonatologists and NICU nurses. The stethoscope looks pretty great and is light weight which means you can easily accessorize it with stuffed animals or other children friendly elements. It is available in different colors and features the same functional design as other modern Littmann stethoscopes. The stethoscope is made of durable materials. It has a machined stainless steel chest piece, an epoxy or fiberglass diaphragm, anodized aluminum headset and next generation tubing. The stethoscope has a 1.9 cm diameter bell and a small diaphragm that specifically helps you monitor infants. It has a floating diaphragm and a non-chill chestpeice cover. The headset is comfortably angled and it offers crystal clear sound. You can also adjust frequency by increasing or decreasing the pressure on the chest piece. This stethoscope is a lot like the Classic II monitoring stethoscope. It is perfect as a diagnostic tool for physical assessments of adult to pediatric patients although it is also used for cardiac functions. The stethoscope is available in various tube colors and chest piece finishes which makes it a great fashion investment. The stethoscope allows pressure based frequency adjustable and is fitted with a tunable diaphragm. It has a comfortably fitting headset and is fitted with single lumen tubing and a single sided chest piece. It weighs only 160 grams and is very functional for experienced nurses. All of these Littmann stethoscopes are superb and as long as you pick a stethoscope that falls in your career category, you should be ok with your pick. For the best stethoscope investment it is always best to choose the latest models since these are designed with the latest technology and as such perform better, are easier to clean and will give you the best functionality in the workplace for a long time to come. It is important to have the right medical equipment at hand when you frequently hold the lives of other people in your very own hands. 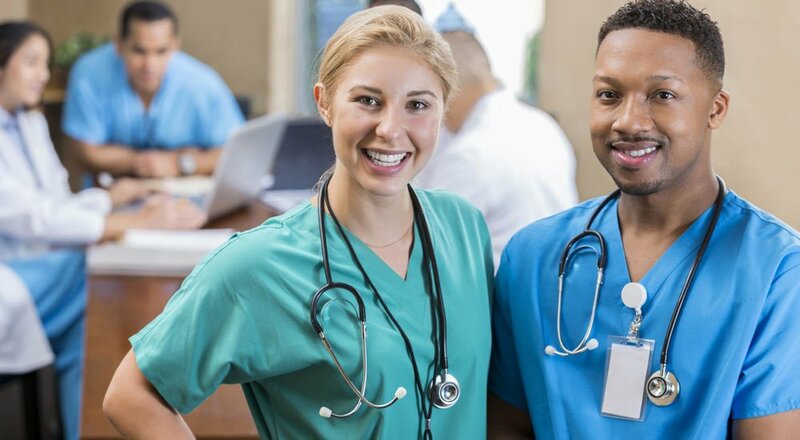 There is no doubt that your training as a med student and the experience you gain over many years of service affects your ability to help those in need. But the type of tools you have at your disposal does have a huge impact on your ability to make an accurate diagnosis on the medical conditions of your patients. 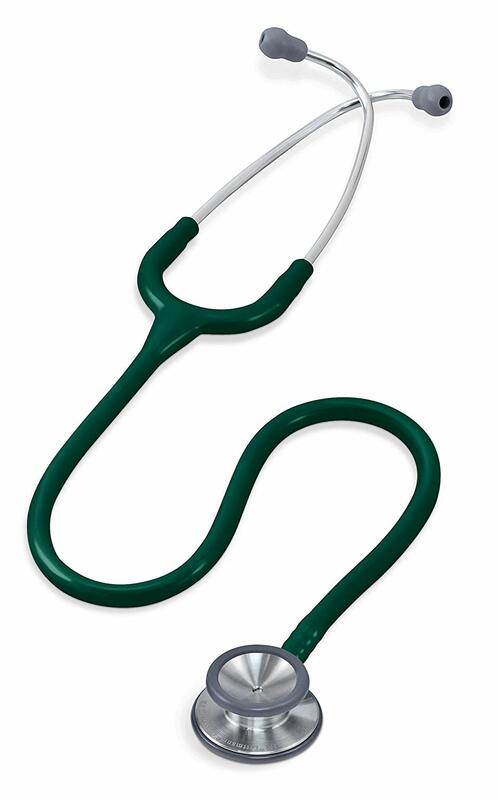 The stethoscope is one of the most used pieces of medical equipment. This handy device was invented by Rene Laennec in 1816 in France at the Necker-Enfants Malades Hospital. Laennec invented the device when he felt uncomfortable to place his ear on women’s chests in order to hear their heartbeat and after discovering that sound was amplified when listening to it through a rolled up paper, he invented the very first wooden stethoscope. Today’s stethoscopes are quite different from those historic devices that were first used in France. Throughout your career, you will sample and buy various stethoscopes. Most medical students first invest in an affordable standard stethoscope and upgrade to a more advanced device upon qualification. 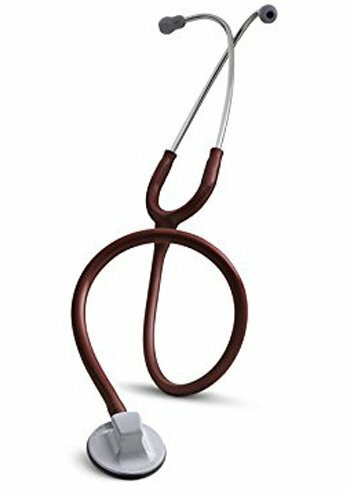 The MDF Classic Cardiology Stethoscope is a terrific pick whether you are a medical student or a professional and highly experienced medical professional. MDF has been creating stethoscopes since 1971 and all of their devices are handcrafted and comes with a lifetime warranty. MDF also distributes other types of medical devices such as blood pressure monitors, reflex hammers, thermometers and more but are especially praised for their high quality, durable and functional stethoscopes. If you are in the market of buying a new stethoscope then you just cannot go wrong with the MDF Classic Cardiology. With more than 400 positive reviews on Amazon alone, this is one of the most popular stethoscopes available on the market. The stethoscope has a very basic yet stylish design. The chest piece and earpieces are made of durable stainless steel and the stethoscope is fitted with durable latex free tubing. Two ComfortSeal ear tips give you hours of comfortable wear and can be replaced should these get worn out over time. 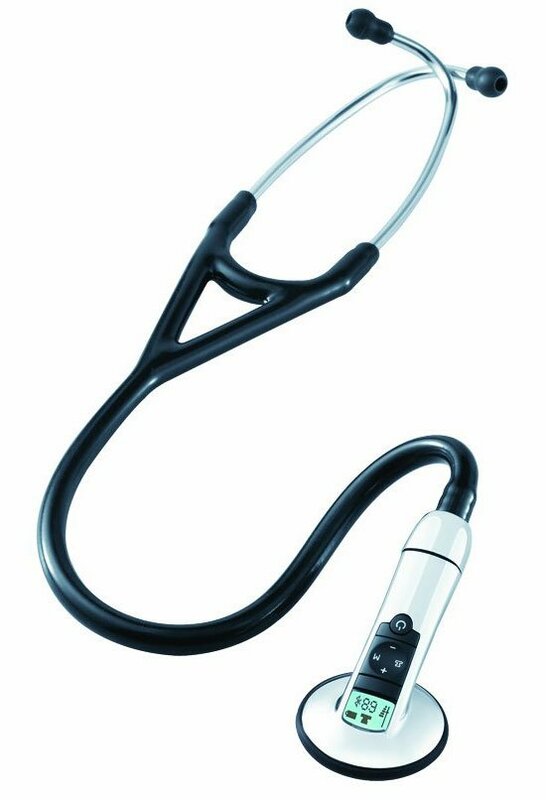 Unlike most stethoscopes, this one is also fitted with an ID tag - a very handy feature for medical students who are constantly losing stethoscopes. The MDF Classic Cardiology is also available in a few different shades and even comes with rose gold finishes which are a welcome edition for medical professionals who love save lives in style. If you are willing to spend some time on shopping then you can even get a limited edition Classic Cardiology that is unique in color since MDF does distribute limited edition stethoscopes upon occasion. As the name suggests, the MDF Classic Cardiology is preferable for cardiology audio but it can also be used for listening for a wide range of other internal sounds such as GI sounds. The stethoscope works in a classic manner as it doesn’t have tunable diaphragms or interchangeable parts for the chest piece. The chest piece is fitted with a traditional chest piece on one side and a high performance open bell piece on the other side. As such it is preferable for adult patients only. The stethoscope is fitted with dual-lumen tubing that consists of two independent auditory channels for an enhanced acoustic performance and better insolation from other sounds. It is one of the few stethoscopes that usually come with a lifelong warranty. The open bell side is suitable for monitoring the hearts of children but is not quite small enough for accurately listening to pediatric patients. Overall it is a preferred stethoscope for adult patients. 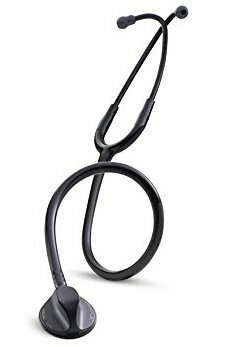 Basically, if you are looking for something sturdy, affordable, classic and practical then you just cannot go wrong with this stethoscope. It has everything that is needed for performing quality work in the medical field and will give you many years of service thanks to its lifetime warranty and sturdy design. The stethoscope is also lightweight which is perfect for medical professionals that work for long hours during the day or night and for busy ER medical professionals. 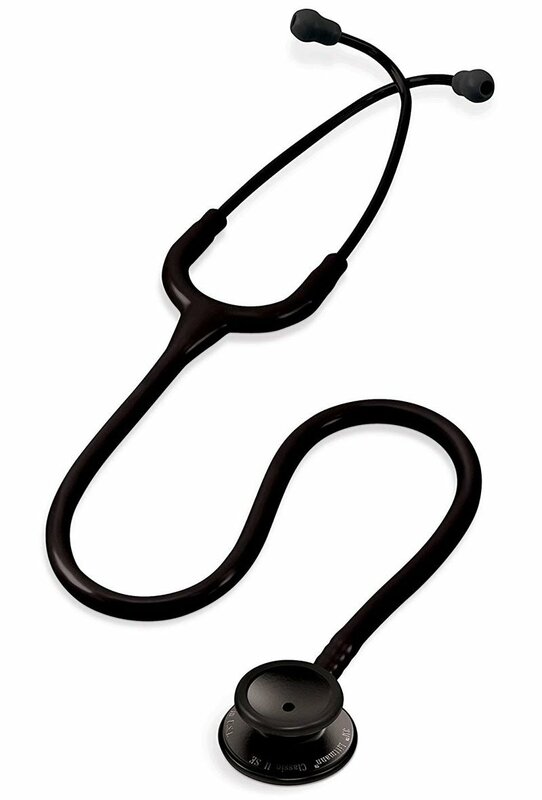 This stethoscope surely will go the distance and will help you out time and time again. In a line of work where you need a stethoscope that you can depend on and that can go the distance you certainly can choose the MDF Classic Cardiology. And if you are looking for something more advanced then you can always consider some of MDF’s more advance cardiology stethoscopes. A stethoscope is one of the handiest tools any nurse or doctor can possibly own. The stethoscope was invented in France in 1816 by Rene Laennec from the Necker-Enfants Malades Hospital in Paris. The first stethoscope consisted of a wooden tube and Leannec invented it because he felt uncomfortable placing his ear against the chest of a woman to hear her heart sounds. These handy medical tools have greatly revolutionized the way medical procedures are done and certainly make medical professionals much more efficient when it comes to making an accurate medical diagnosis. Modern stethoscopes are quite different from the wooden tubes first used in France and are used for much more than just practicality. The type of stethoscope you wear greatly affects your personal status amongst other medical professionals and med students. 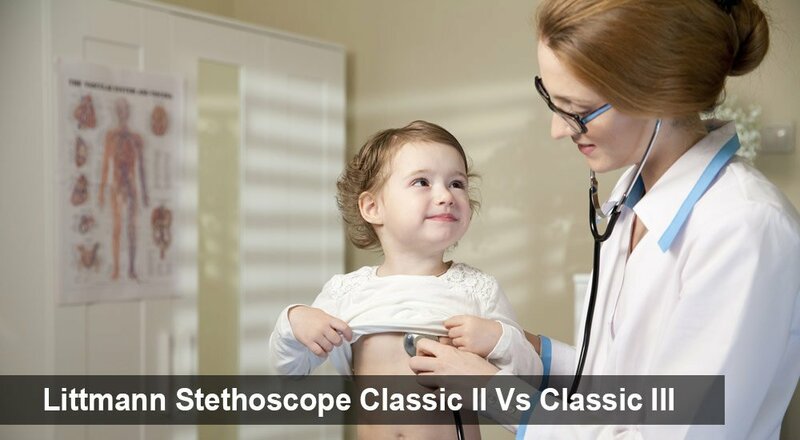 If you are looking for a functional stethoscope that does its job and enhances your overall personal status then we highly recommend the Littemmann Classic II and Classic III stethoscopes. Both of these stethoscopes are well designed, highly durable and functional. But which one is the best and – more importantly – which stethoscope is the best for you in person? If you want to know then you can certainly check out the following review on these two stethoscopes. 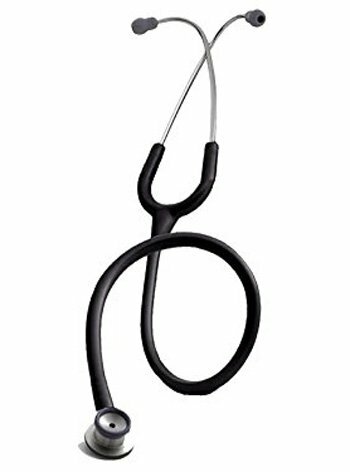 The Littmann Classic II is one of the most popular stethoscopes amongst medical students and many qualified medical experts and even experienced cardiologists also prefer to work with this stethoscope well after obtaining their master’s degree. 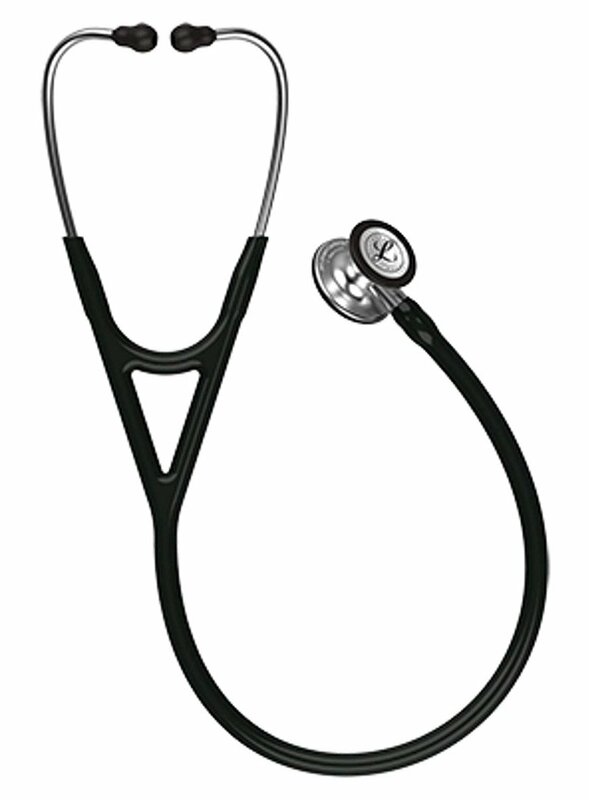 Overall, the Littmann Classic II is very simple in design as it is a standard medical tool. The stethoscope is available in 9 different colors and features an award-winning ergonomic design those results in excellent acoustic sensitivity. The stethoscope is used to detect misalignments in various parts of the body including the heart, lung and other internal organs. The biggest design difference in the Classic II and Classic III is that the II has a T shape design at the neck. The biggest functionality difference is that the Classic II resolves GI sounds better and as such is preferable for average checkups or for listening to a variety of different sounds other than the heart. The Littmann Classic II is also a lot more affordable than the Classic III which makes it preferable amongst medical students. The Littmann Classic III is a slight step-up from the Classic II but not in all ways. This stethoscope is preferred by cardiology professionals and high-performance medical experts but is also loved by plenty of medical students that want to invest in a highly durable stethoscope that will give them great functionality over time. The Classic III is more expensive than the Classic II. It is available in 16 colors and 6 finishes and the overall design is a bit more aesthetically pleasing than the Classic II. It has two tunable diaphragms, is highly sensitive to acoustics, is fitted with a two-sided chest piece and is lightweight yet made from strong durable materials. The single-piece diagram is easy to attach and clean and next-generation tubing is latex free which is preferable for patients with latex allergies. The chest piece is also time-saving since an increase in pressure allows you to listen for low to high frequencies. The biggest difference between the Classic II and the Classic III is that the Classic III seems to be preferable for listening for heart variations because it is more tuned in for sounds of the heart than the Classic II that is better for a wide range of sound types. Both of these stethoscopes are superb investments for medical professionals and students alike. If you can afford the Classic III then, by all means, go ahead and indulge. The wide range of colors and two tunable diaphragms allow for high-performance work and the stethoscope is especially preferred for cardiology inspections. The Classic II is a more budget-friendly solution that is just as good as the Classic III and is often preferred for listening for other types of friable frequencies other than the heart and, for this reason, it is often preferable for medical students, house doctors and nurses. Quilting is a fascinating hobby that has been practiced since 3400 B.C. These beautiful and colorful bedding covers and blankets were highly sought after in early years and are now making a big comeback since handmade items and especially quilts are huge interior decorating at the moment. Why does everyone love quilts so much? Well, for one thing, these types of linen are completely unique in their kind. Each and every quilt you make can be designed according to your heart’s desire and each and every quilt is work of art that will delight you and your family for years and that will decorate your home for a lifetime to come. Any quilting guru will tell you that the only way to create a beautiful and high-quality quilt is by investing in good quilting machines. Making these blankets takes a long time and the last thing you need while you are trying to create something beautiful and creative is a machine that messes up your fabrics and that is a nightmare to operate. 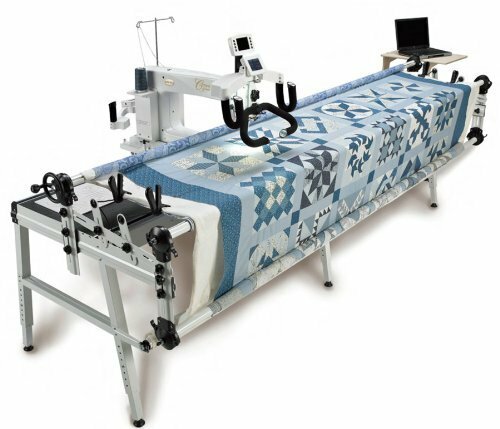 If you are taking up quilting as a hobby or career choice then we highly recommend the following 6 long arm quilting machines. A long arm quilting machine isn’t much different from a normal sewing machine. But as the name suggests; it is fashioned with a longer arm or bigger throat that makes it easier to sew decorative stitches and large fabric pieces. Industrial long arm quilting machines are fitted to a quilting frame that ranges from 3 up to 4.25 meters in length. The fabric is rolled and spread onto the frame and the quilting machine is then used to stitch on layers of fabric or decorative stitching onto the fabric. Long arm quilting machines are used to create all sorts of quilts because they can be wired with different colored threads, they are programmable with different stitch patterns and many have advanced functions that enable you to program the machine for automatic quilt stitching. What to Look For In a Long Arm Quilting Machine? The price – Quilting machines vary greatly in price. Smaller multifunctional machines can be acquired relatively affordable since they range from as little as $300 but don’t be surprised at all at the much more expensive industrial quilting machines that cost well over $20,000. The budget you have in mind will certainly impact the type and size of machine you are looking to buy. Easy to learn – You need to be an experienced quilter to use industrial quilting machines. These machines are not the easiest to learn. If you are completely new to quilting then it is best to choose a more affordable quilting and sewing domestic machine. Fun to operate – Your machine shouldn’t be a nightmare to operate. Quilting, like all other forms of art, should be fun. Look for machines that have time-saving functions such as auto threading and that are programmable if you want to have fun while creating beautiful quilts. Consider maintenance and repair – All sewing machines require quite a bit of maintenance because you need to keep these machines lubricated and clean to keep them in good working order. It is also wise to choose a machine brand that can be fixed locally so you won’t have to travel long distances to get small repairs on your machine done. Consider space – Quilting machines are not too big but for commercial projects, you will also need to use a quilting frame. These frames range from 3 – 4.5 meters which can take up quite a lot of space in your home. What is your functionality – Are you creating quilts for yourself? Then a small sewing and quilting machine is probably best. If you are serious about quilting and want to pursue it as a hobby or to earn a living then it is best to invest in an industrial quilting machine and frame. The frequency of use – If you are going to use a quilting machine occasionally then perhaps a smaller machine is best but for a machine that you will use every day or just about every day, a bigger machine that is programmable will be a much better pick. The size of your quilts – Small quilts are simple to make on a small quilter or even an average sewing machine but for bigger quilts such as map sized or bed sized machines, you really should consider investing in a machine with a wide throat and a quilting frame on which you can mount your quilt. Stitch regulation – This feature automatically regulates the length of your stitches no matter how fast your machine works and is advisable for those looking to make money from selling quilts. Throat space – Machines with deeper throats gives them greater reach. This means that the area they reach are bigger which means you can create bigger quilt patterns or squares before having to move the machine. Upgradable – As you progress in quilting you may feel the desire to perform different tasks. Upgradable machines are computerized and can be reprogrammed with different sewing and stitching patterns. Accessories available – The type of accessories there are for the machine in question will have a huge impact on your function. Different machine accessories such as micro handles, hopping feet, bobbins, laser light, and other features enable you to perform a much greater variety of quilting tasks. Machine weight – Heavy machines can cause back pain, neck and muscle strain and more after a couple of minutes of use. Serious quilters really should consider a machine that weighs less than 65 pounds. Training – If you don’t know much about quilting or long arm quilting machines then it is important to get adequate training as soon as you buy your machine. Most people that fail at quilting fail because they just don’t know how to operate their machines correctly. There are quite a few different types of quilting machines available on the market and these machines can vary quite a lot in terms of functionality and price. To find the best quilt for your unique needs you will need to consider your budget, the functionality of the machine, consider how often you will use it and the accessories that come with these machines. 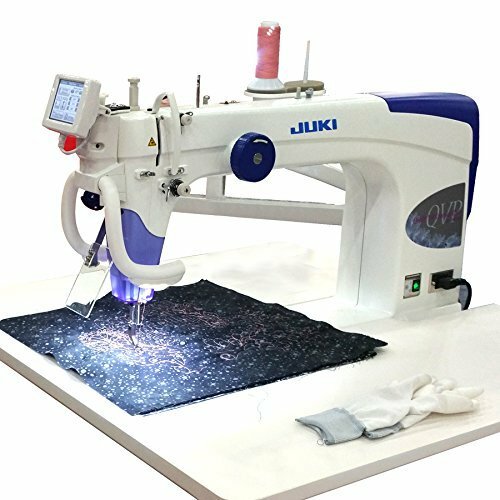 Juki sewing machines are still relatively new on the market with domestic machines but are already impressing sewing and quilting lovers tremendously. Their machines are popular in about 170 countries but they have been distributing industrial quality industrial sewing machines well before 1988. These modern machines are astounding quilters because they are so easy to use, so functional and they enable thousands of people to create gorgeous quilts from the comforts of their home. If you are looking for a modern, sturdy and functional quilting machine then we highly recommend the Juki TL-2200QVP sit down machine with its long arm. Overall the Juki TL2200QVP has a beautiful look. The machine is white with bold accents of blue. It comes with a table and stand, is foot controlled and is fitted with an auto thread trimmer. The LCD Screen enables you to choose from a wide range of stitches and that can be updated. The machine has an adjustable height that ranges between 30” – 34”. What really makes the Juki TL-2200QVP exceptional is the fact that it can be used for both sewing and quilting. The Juki TL-2000QI is much more streamlined and offers a more elegant look. The machine is all white and is manually adjustable by knob. This sewing and quilting machine can master up to 1500 stitches per minute with ease which is perfect for speeding up the quilt making process. The machine comes with an extension table for a wider work area and is surprisingly affordable for such a pristine machine. The TL-2000QL does not come with speed control but speed is easily controlled once you have a better feel for the pedal operation. This is the ultimate overall machine because you can use it for both sewing and quilting. Brother industries Ltd is a trusted sewing machine manufacturer that have been creating quality machines since 1908 when it was known as Yasui Sewing Machine Co. These machines didn’t get their current name “Brother” until 1962 when they started distributing quality sewing machines internationally. 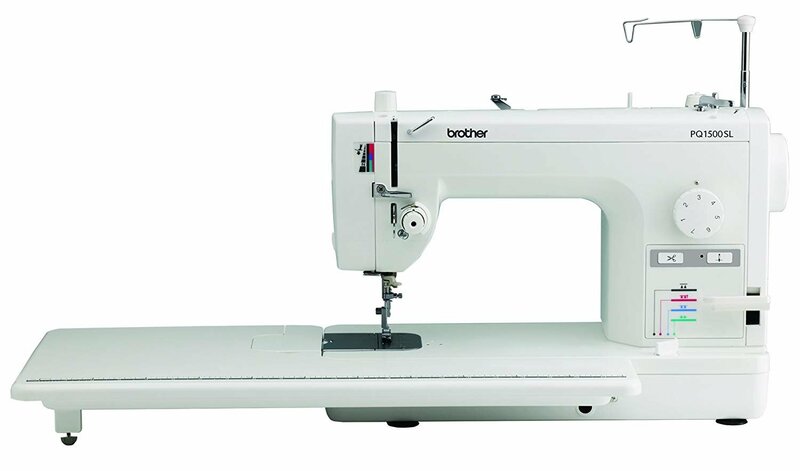 This is one of the best sewing and quilting machines available on the market and the Brother PQ1500SL certainly is priced fairly. This sewing machine offers a simple yet elegant overall look but is packed with slightly more features than your average entry-level machine. The Brother PQ1500SL has an auto thread trimmer and a built-in needle threader that eases sewing projects tremendously. The machine can sew up to 1500 stitches per minute and gives you multiple settings which you can access with ease by adjusting the knob. The machine is also fitted with an extra-long table and a knee lifter that makes it easier to sew large quilts. The Grace Q’nique long arm quilting machine looks somewhat different from other quilting machines thanks to its two comfort grip handles attached to the machine. These grip handles are terrific for moving the machine where you need it and gives you a firm hold on your quilting machine as you work. The Grace Q’nique has a 14+ inch throat that allows you to sew larger patterns and big quilting blocks without feeling cluttered on your work area. It is easy to control the machine or to select different function thanks to the quick-access buttons placement. This machine is quite fast at 1800 stitches per minute which makes it a perfect investment for those who are serious about quilting and it even has stitch regulation that keeps your stitch lengths and speeds constant as you work. LED work lights offer plenty of illumination and the dual-cone thread towers enhance work comfort tremendously. If you are very serious about quilting, have a bit of experience or want to step into quilting for business then this is the best machine accessory you can consider. The Grace Majestic Quilting Frame is compatible with your quilting machine. This large frame holds the fabric firmly in place as you work with your sewing machine. The fabric is rolled and stretched around the frame and lots of comfort grip handles allow you to move your quilting machine up and down the frame in order to create different patterns. The frame comes with a machine bench that is fitted with wheels so you can move the quilting machine along the frame with ease. This frame is terrific for easing the quilting process of large pieces such as tapestries and large comforter quilts, blankets or throws. Suitable for quilting machines with up to 18” throat. Singer has a long history of creating top quality sewing machines. Singer is an American brand and was first established as M. Singer & co. by Isaac Merritt Singer in 1851. People have loved the Singer brand sewing machine since the very first moment these sewing machines hit the market because they are so highly durable. In fact, many Singer sewing machinesdating back from the early 90’s are still just as functional today as they were over 100 years ago. Best industrial quilting machine – For industrial projects you can certainly consider the Juki TL-2200QVP-S Sit Down Long Arm Sewing and quilting machine. This quilting machine is programmable, upgradable and has handle grips that makes it easy to maneuver as you work. Alternatively you can also consider the Grace Q’nique long arm quilting machine with its easy grip handles and quick access buttons. This machine isn’t as easy to program but is pretty functional for quilting. Best quilting frame – If you are investing in an industrial quilting machine or any quilting machine that will be used for commercial purposes then we highly recommend getting the Grace Majestic Quilting frame as well. This frame greatly eases the quilting process when you are taking on large quilting projects. Best domestic quilting machines - There are quite a few good sewing and quilting machine on our list. 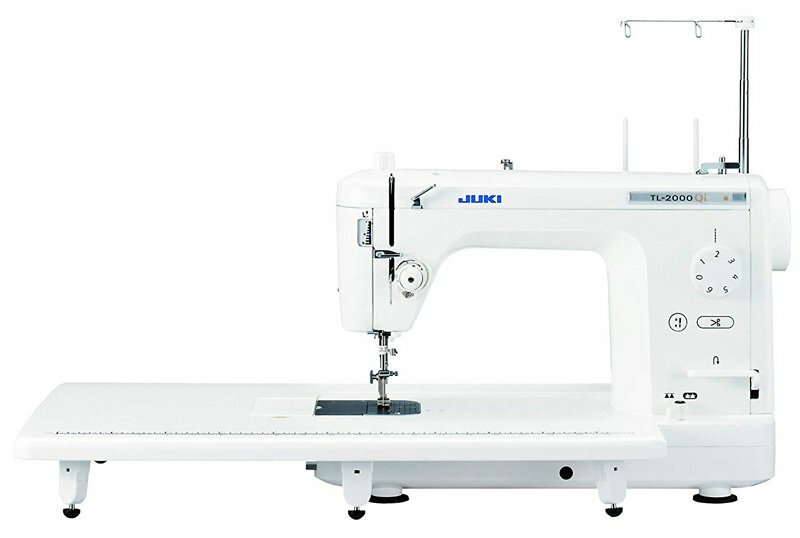 The Juki TL-2000Qi is perfect for all of your home sewing and quilting projects because it is so sturdy and easy to use. The Brother Quilting and sewing machine is also a good pick thanks to its advanced features such as an auto thread timer and built in needle threaded. 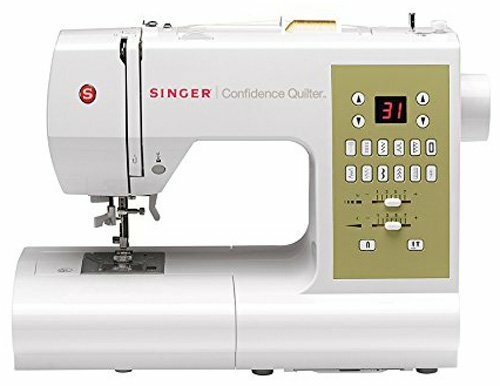 And if you are looking for a trusted machine with lots of built in stitches then you just won’t go wrong with the Singer Confidence Quilter with its automatic needle threaded and drop and sew bobbin system. 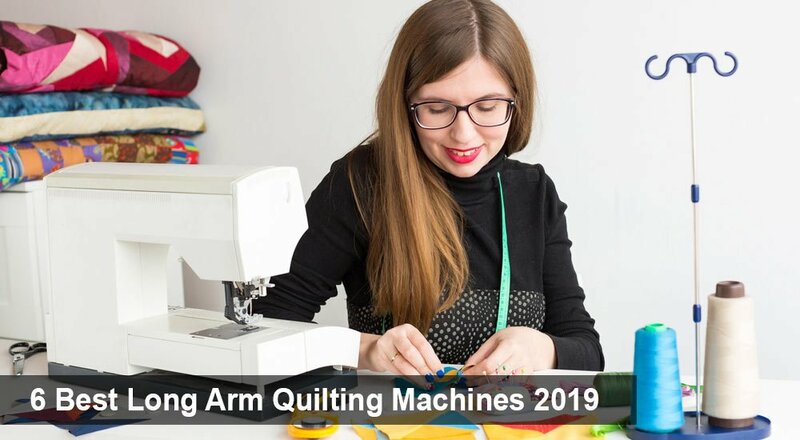 We hope that these reviews help guide you to the best long arm quilting machine so you can find great value for money and invest in a trusted machine that fulfills your every quilting need. Do you love the taste of fine coffees like mochas, macchiato and cappuccinos then you are likely in the market for a good coffee maker. After all, with one of these machines in your home you can enjoy yummy coffee all the time and you can thrill all your guests with fine tasting coffees instead of those horrible tasting instant powder coffees. As you shop for the best coffee machine you will quickly note that fining a good quality coffee brewer isn’t quite that easy, especially if you don’t want to spend a small fortune on a machine. 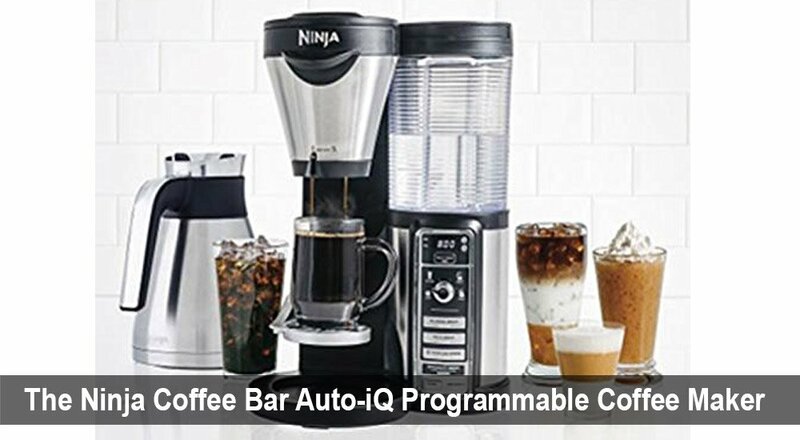 The Ninja Coffee Bar Auto-IQ programmable coffee maker is a real breath of fresh air because not only is it a terrific dual coffee maker, it is also affordable. 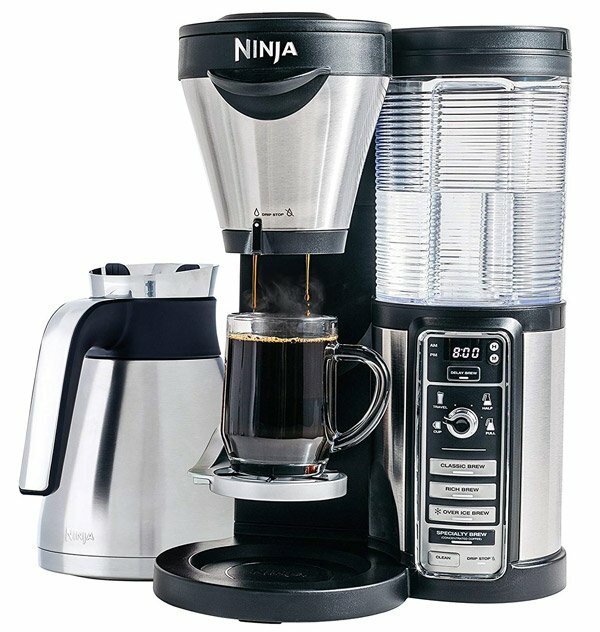 You can definitely look into this handy little coffee bar for home and office use so you can enjoy “better than coffeehouse experiences at home” or on the job. This dual coffee machine sure does have a terrific overall look. A combination of black, grey and transparent colours and the square design of this coffee maker will fit perfectly into any kitchen. The coffee maker offers a modern charm and yet, it also provides a retro look. Controls – The coffee maker has a digital time display for easy time viewing even in the dark. It is fully programmable and you also have quite a few coffee brewing functions to choose from. The device allows you to brew coffee amounts that range from a small cup, large cup, travel cup all the way to a full carafe size. You also have the option to brew classic or rich coffees and for cool beverages, you can set it on the over ice brew setting. Capabilities – This brewer is incredibly functional and is a perfect multi-purpose coffee bar for home and office use. You can make numerous beverages including specialty coffees, iced coffees and more with this handy coffee maker. What is truly remarkable about this product is the fact that you can use different types of cups and pots in the machine. The coffee maker also has a milk frother to the side that is very easy to use. Cleaning – Cleaning this brewer s incredibly simple. The frother to the side can easily be detached for washing and the machine comes with an auto-clean function that you can use to rinse out the brewer after use. All loose cups and carafes are also incredibly easy to wash in a sink and the reusable filter is made of a durable plastic that can be washed with ease. This coffee maker has plenty of pros but there are also a few cons you need to take note off before you decide on this specific unit. Overall this is a terrific coffee bar for anyone who loves a simple machine that can produce a great variety of beverages for any type of weather. Back in the 1960s, cutting metal was basically by means of metal to metal. As a result, there were many drawbacks associated with this form of cutting and they had to implement a way to curb this. In welding, using the gas mixture was accompanied by a poor surface finish, untidy surfaces and was so slow. Using the Computer Numerical Control (CNC), it gave a diversity in the shapes and the metal sheet sizes cut, leading to a quick cutting method. Air, Oxygen and other unreactive gases compressed in the cutter are channelled to the workpiece under operation. 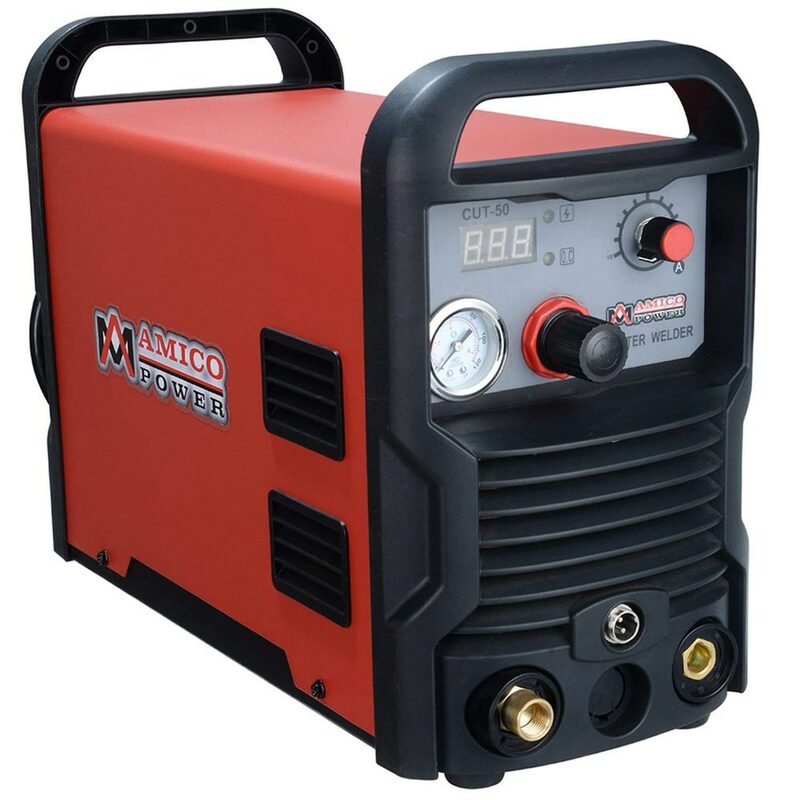 The superheated gas is fed to the workpiece at very high pressure through the nozzle. A metal rod placed between the nozzle and the metal being cut ionizes the plasma forming an arc. This arc causes melting of the metal when in contact, thus the metal is cut. This is an efficietn and quicker method than other methods that were used in the past to cut metal. ​These cutters makes use of a very hot mixture of gases to cut metals of good electrical conductivity. The process involves the gas being applied from a nozzle of the cutter and blown at a very high speed to the workpiece, this results in the metal melting, therefore, cutting it. 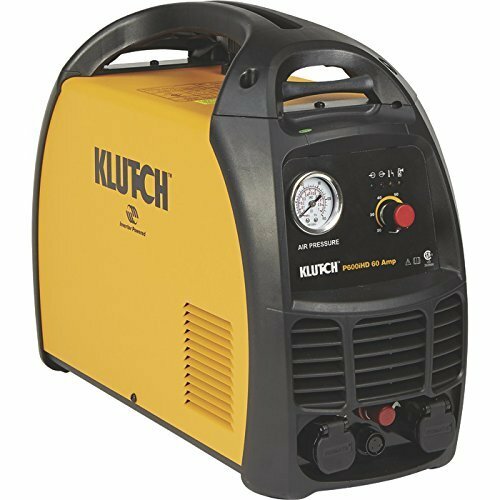 Oxygen gas and other unreactive gases when heated at high temperatures are the primary constituents of the plasma cutters. They are usually of two categories and are classified according to the type of contact made by the metal being cut and the plasma nozzle. In that respect, they are contact and non-contact plasma arc. In the contact plasma arc, the nozzle makes a contact with the metal cut hence production of ignition spark. In a non-contact one, it makes use of frequency or voltages supplied to the cutter thereby producing ignition sparks. They are classified according to the mechanism of spark production involved. Some of the processes utilise contact mechanism while others make use of the frequencies or voltage supplied for spark production. This process is categorised into three; contact, Arc Pilot and CNC processes. All these three categories use different cutting tables which are specific to the mechanism used. These are the traditional types, they make use of Field effect transistors for the conversion of AC signal to DC signal. Inverter rating ranges from around 10000HZ to 200000HZ. This frequency is usually associated with power factor correction which limits the efficiency of the cutter. Though nowadays they are using IGBTS rather than the MOSFETs, this ensure no parallel running of transistors. In this type of cutting, a programming software is incorporated to the cutter and a torch. The program controls the manner in which the torch moves, the rate at which it cuts also determines the cut dimensions of the metal cut. It makes use of the CNC table. The CNC is the recent type of the cutter and can cut thick lead metals. With the contact process, the user has to keep the nozzle and the metal being cut in contact so as to ensure spark production continues. It uses high-frequency plasma table and is usually used for cutting metals of high conductivity. For the pilot arc, there is no contact between the nozzle and workpiece cut. In such case, the table used produces the arc and the user maintains the separation of the plasma and the workpiece. Mostly it’s used for cutting insulators especially plastics. 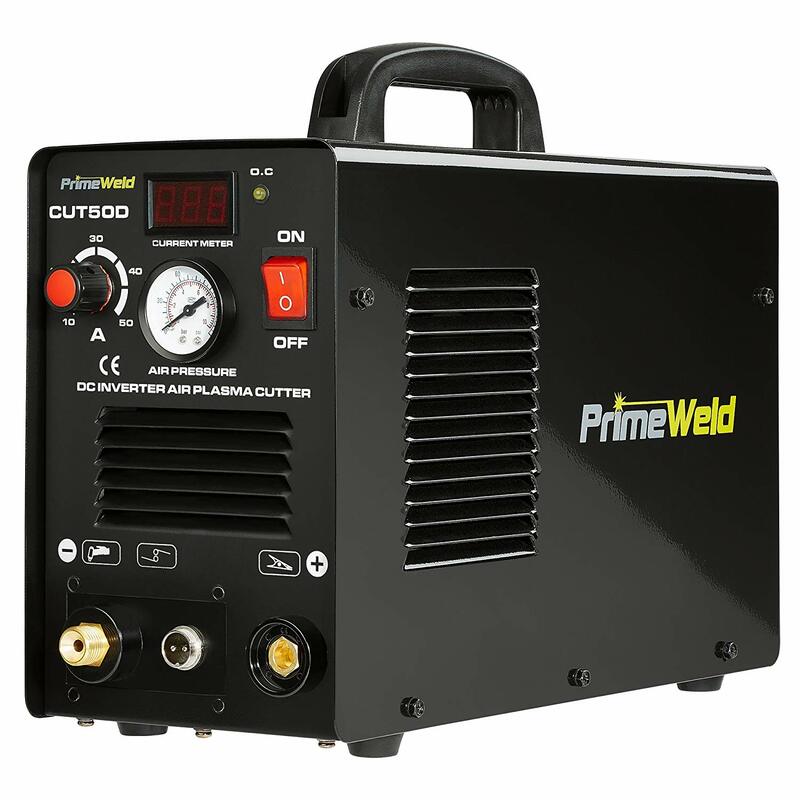 With the varying features of plasma cutters, they have diversified areas of applications ranging from simple artisan works to such complex metal works including manufacturing of cars and fabrication of steel. They are used by artisans because they are portable and require less input for work. For commercial production such as car manufacturing, they are of large size and require a quantified amount of input to function. Other areas where they can be used include the metal recycling companies, finishing operation on metal work that’s removing unwanted materials from a workpiece, demolition of unwanted metal structures and many other industrial operations. A cutter with a rating of about 60Hz costs around $4000 on Amazon. There are, however, other types of cutters with fewer features and limited application areas cheaper and can cost around $1000. It all depends on specifications and the type of metal the cutter is intended to cut. Like any other machine, there are hazards involved when using this type of cutter. Protective clothing such as overalls, safety boots, gloves and sunglasses should be worn by the user. 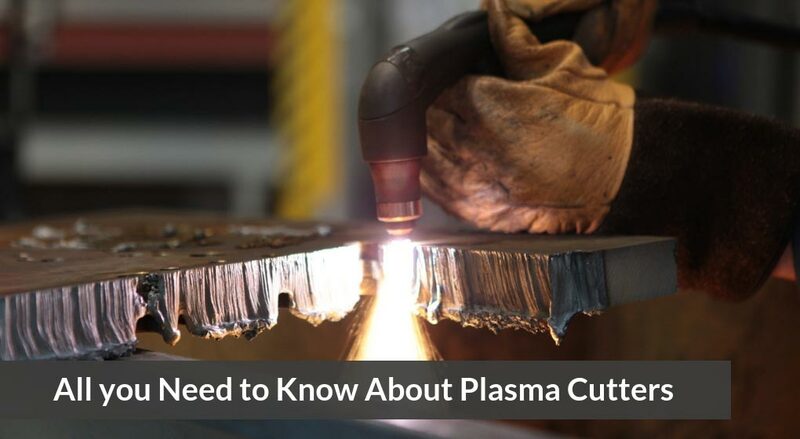 The sparks associated with plasma cutting are often at high risks of causing a fire, so to ensure no fire hazards associated when using it, it is important to keep away highly flammable such petrol, kerosene or diesel substances from the area of operation. They usually produce a clean and smooth finish. Cutting using the computerised cutter is quicker hence time-saving. ​The ignition sparks affect other people who are not in protective clothing. ​​These cutters are so far the basic metal cutters for all cutting operations. They have a wide array of benefits such as cutting thick and electric conductors make them unique for many operations. Since they incorporate the use of a computer aided mechanism that ensures speed, accuracy and precision, they are emerging as the choice for large manufacturing operations cutting. These cutters are easy to install and the cost of purchasing and maintaining is also low. So they are affordable to the people who may need them. Also, operating these cutters is not complicated. They are easier to use and anybody with a mere cutting skill can use them. ​Roto molded coolers keep ice cold for long periods of time. They also protect your perishable items from forest animals such as grizzly bears. That’s because roto molded coolers are made from a material called rotationally molded plastic. The process known as rotomolding makes sure that all of the cooler gets created with a thickened wall that don’t have any mistakes or imperfections. Roto molded coolers can also stand up to a lot of rough handling, including abuse from big, angry forest creatures like grizzly bears. These type of coolers can last an extremely long time, almost a lifetime. When a manufacturer creates a roto molded cooler, they fully expect that the ones that they sell will be the last ones that their customers will ever need to buy. It is this tough grade product that causes organizations like the Interagency Grizzly Bear Committee to certify roto molded coolers. Animal agency-certified coolers also make sure that the materials don’t hurt animals if they eat them. 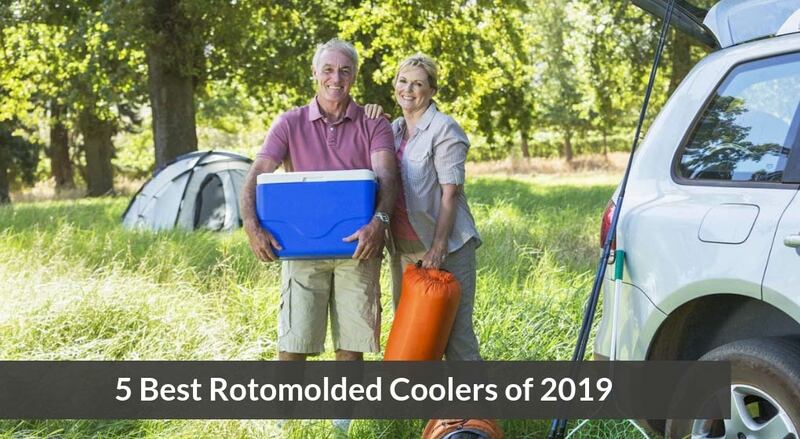 ​​​​​Unlike other types of coolers, roto molded coolers truly are the best when it comes to the durability and sturdiness of its material. While a roto molded cooler will cost more than most coolers in their class, they are still worth the added cost. Having a cooler that can protect your food and possessions against animals and the elements is so valuable to you as a customer that most people don’t mind having to pay more for roto molded coolers. When it comes to keeping your ice, there are no better coolers than roto molded coolers. That’s because ice can stay in these coolers for up to 10 days. Ice retention allows you to keep your beverages cold. If you’re on a fishing trip, it keeps your fish from spoiling. Roto molded coolers will also keep your ice cold in extreme weather conditions. However, buyers should note that the weather conditions play a role in how long the ice in your roto molded cooler will keep. These coolers are called high end due to their price point. But due to their sturdiness and durability, it’s not hard to figure out why they have high prices. In addition to their roto molded plastic, these coolers have neoprene seals and insulation that keeps the cold air on the inside and the warm air on the outside. The majority of roto molded plastic is UV resistant these days. If you’re in the sun for a long period of time, the heat will not adversely affect the items inside of the cooler. Roto molded coolers will also not warp or become brittle because of exposure to the sun. Yet another great feature of roto molded coolers are the heavy latches that make them hard for animals to access and open. Roto molded coolers have a rectangle shape that allows them to get hoisted into the back of your truck or boat while taking up very little space. These coolers have grips on their feet that let your cooler stay in place as your vehicle is moving. Roto molded coolers are also made to be leak proof, which means that your cooler’s contents won’t suffer from moisture damage if it topples over. These coolers also weigh more than your average item in this class. For this reason, many of them come with a rope handle so that you can easily hold and transport them. Which roto molded cooler should you buy for your next fishing trip or tailgate party? This review will look at 5 roto molded coolers and will discuss which ones are the best value, the best for ice retention, and the best overall. Orca coolers are great for avid outdoorsmen who want bear-proof items that hold up against the ups and downs of a life lived outdoors. These coolers also have great ice retention capabilities. In a famous consumer test, an Orca cooler was filled with ice and chilled beverages for five days in order to test its ice retention. When the five days were up, the testers found that the Orca coolers could keep holding ice for a few days after the testing ended. The testers found that the Orca cooler held its own against some of the giants in the roto molded cooler market, such as Yeti, Grizzly, and Pelican. 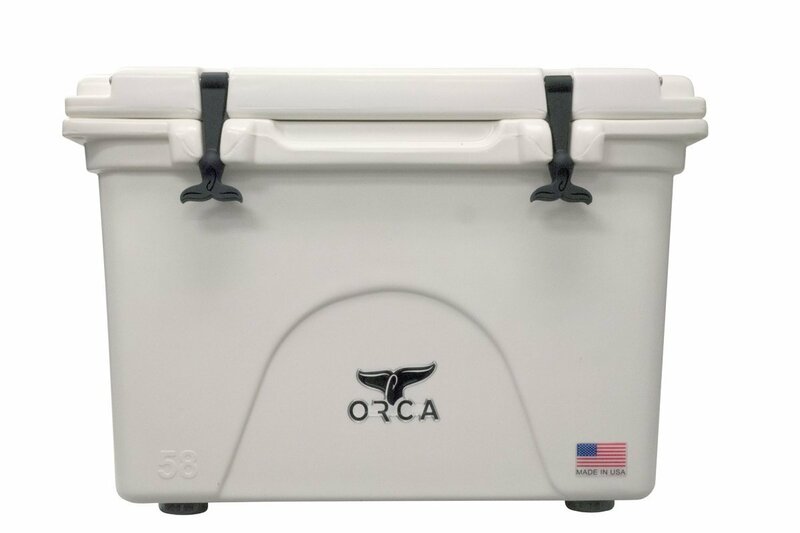 ​The Orca 58Qt is one of the more popular makes in the Orca roto molded cooler brand. This cooler may be larger and heavier than other smaller roto molded coolers, but its usability more than makes up for its small size. When the cooler is empty, it weighs a little more than 30 pounds. But that doesn’t stop the vast majority of owners from being able to hold it and carry it easily from place to place. The heavier weight doesn’t stop many owners from being able to carry it around by themselves. However, its extendable grip handles allow you and a friend to carry it between the two of you with no problem. The 58Qt has a flow drain spout that makes emptying the cooler of liquids an absolute breeze. There’s also a lifetime warranty on all Orca coolers, including the 58Qt, so you know that you’ll get a life’s worth of use from your Orca 58Qt roto molded cooler. Roto molded cooler manufacturers put a lot of different selling techniques into the market. All of this to tell you about yourroto molded cooler options. 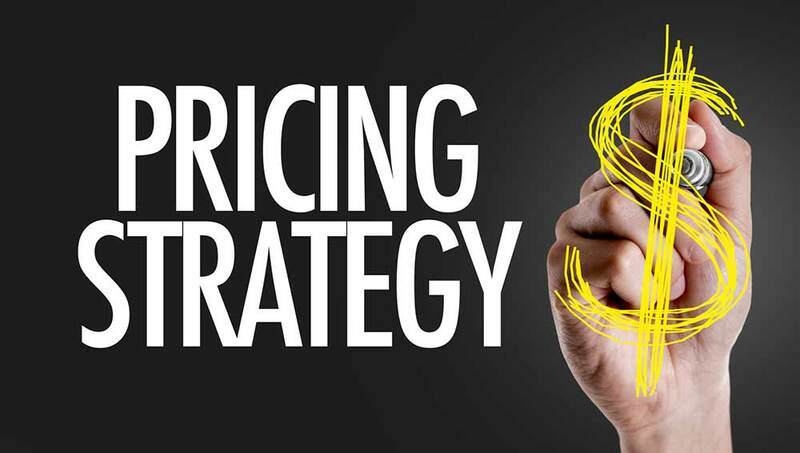 Some manufacturers may try to lure you in with price while others want to sell you on the quality of their products. While the Engel coolers are not cheap when it comes to price, they’re less costly than market competitors like Grizzly or Yeti. However, Engel coolers will give you the same high level of quality that you’ll get from some of their more expensive counterparts. Some consumer testers ran a five day ice test where they put some ice and chilled beverages in differentroto molded coolers to determine their ice retention capabilities. According to the testers, the Engel coolers held ice for 5 days, making it one of the best performers in the elite cooler class. Engel Deep Blue coolers has the best insulators on the roto molded cooler market with its 2 inch insulated walls and interior made of plastic. The cooler features a gasket seal that’s not only freezer quality, but also air tight to boot. Because of this technology, you won’t have to worry about food spoiling before you get to your destination. It can withstand a lot of rough usage, bumps, tears, and other pressures. It’s even bear-proof. The Engel Deep Blue coolers come with a non-skidding lid with holes in the front corners where you can put the lid locks. The only con related to the Engel Deep Blue cooler is that many users have reported that the latches and lid aren’t nearly as easy to use as advertised. However, this issue is nothing that a little fiddling and problem solving won’t solve. Yeti Tundra coolers are known all throughout the market for its exceptional quality. Unlike their cheaper competitors, the Yeti Tundra can resist all types of pavement and floors, sun and heat exposure, and weather conditions. All of this is due to their one-of-a-kind features that keeps everything within the cooler safe and intact for days, not just a few hours. On the Yeti Tundra, latches and hinges do not break and malfunction. Therefore, you’ll always have ease and convenience whenever you take your cooler outdoors. In the five day ice test, the Yeti Tundra held ice for all five days with a medium amount of use. It even beat a couple of its well-heeled competitors in the roto molded cooler market. However, one con is that it wasn’t the best performer in the five day ice test. If you want a consummate performer that will hold your ice for days on end, you might want to look at the Engel Deep Blue cooler. But Yeti didn’t earn its reputation in the roto molded cooler market for nothing. 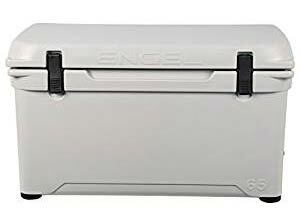 When you buy a Yeti Tundra, you can still get a cooler that will hold your ice for up to a week with moderate use. For over 50 years, Pelican ProGear has made its name by creating high-quality products that come equipped with top-of-the-line lighting systems. Recently they have even dipped their toe into the marine cooler market. 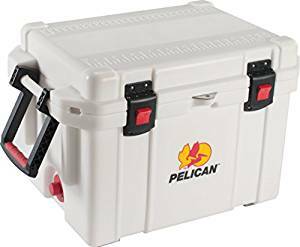 The insulation found in Pelican Elite ProGear coolers is such that many merchant websites have put them on the top of their lists for the best in the entire market. They hold their own in their constant competition with tough opponents such as Yeti and Engel. In the five day ice test, it turns out that the Pelican Elite ProGear was among the best performing coolers tested. This cooler easily held its ice for five days. Pelican’s manufacturer advertises that it can hold ice for up to 10 days. However, consumers should note that the Pelican Elite ProGear was the heaviest roto molded cooler that was tested. The Pelican Elite ProGear comes with a gasket (freezer grade) and 2 inch insulators on the inside of the lid. Its two sets of handles allows you and a friend to transport the cooler without any trouble. The cooler’s latches are also wide enough that you can handle the cooler while wearing gloves. The feet of the unit protects it from getting ugly scratches during rough usage. It won’t slip and slide, even during rough weather. The hardware’s construction is made of stainless steel that disallows corrosion. Lastly, the Pelican Elite ProGear comes with a lifetime guarantee on the cooler’s craftmanship and materials. The item’s cons include its weight and its expensive pricing. In the five day ice test, the Siberian brand of roto molded coolers performed comparably to its competitors. It easily held ice for the five day testing period. The manufacturers advertise that these coolers can hold ice for up to 8 days. The Siberian coolers holds 40 quarts of ice for up to 8 days. It is outfitted with beverage holders that are built into the cooler. The cooler is also strong enough that most people can sit on it. It features hinges made of stainless steel, a freezer-grade gasket, and non-skidding pads. At less than $250, the Siberian is the best value for your dollar. At 18.5 pounds, it’s also extremely lightweight, so transporting the cooler from one place to another is very easy. Transport is also made simple due to its rope handles. The Siberian also comes with a lifetime guarantee. 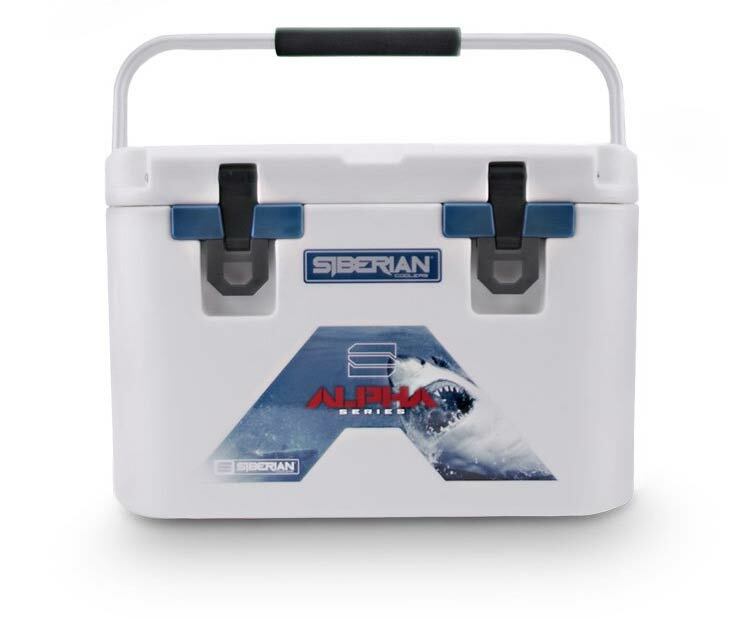 If you like the idea of buying a Siberian cooler but want one that is bigger than 18 pounds, then consider their 64 quart cooler. It comes with all of the same features as its smaller cousin. The main difference is that it weighs 7 pounds heavier (25.5 pounds) than the 40 quart version. If you want great value at a slightly bigger size, then consider purchasing the Siberian 64 Quart Ice Chest. Which Roto Molded Cooler Should I Buy? That depends on what you are looking for in a roto molded cooler. While some customers want maximum ice retention, others want coolers that they can easily carry, and others are only looking for the best value. The great news for roto molded cooler customers is that there’s a cooler and cooler brand for every type of customer. For customers that want maximum ice retention capabilities: These consumers should look no further than the Orca 58Qt cooler. It can hold ice for well over five days. If you’re taking an extended trip, look at Orca coolers. For customers that want versatility: These customers will want the Engel Deep Blue cooler. Its technology will help keep your food and beverages fresh for days. Its hardware will also help the cooler withstand the roughest treatment. For customers that want value: Look no further than the Siberian brand of coolers. 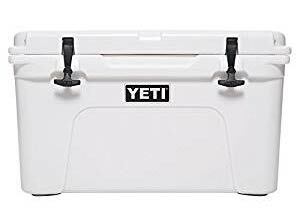 Not only will purchasing this cooler not break the bank, but the smaller coolers in the brand won’t break your back when you carry it from place to place. Do you love the taste and variety of K-cup coffees? Do you also love specialty coffees such as cappuccinos, lattes and more? Well, then you definitely need the Keurig K-Café single serve coffee maker. 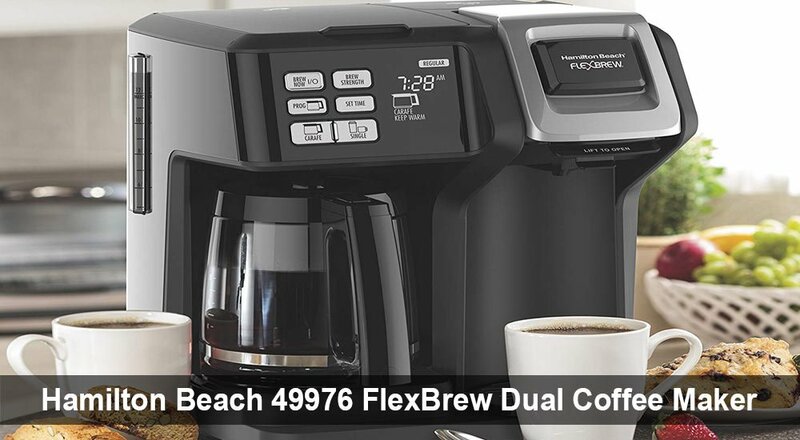 Like all other coffee makers, this one functions with K-cups only and allows you to brew any of those terrific coffee flavors in the Keurig range. This little coffee machine is, however, a little bit above average Keurig machines because it has a dual purpose. You can use it for normal coffee brewing and specialty coffee brewing. It is the perfect investment for office use and even for the homes of those that love to enjoy or serve restaurant quality coffees to guests. This Keurig machine looks just as great as all other models. It does take up a little bit more space than usual due to the side positioned milk frother and heater but is still compact and perfect for a mini coffee bar. Controls – The controls are positioned on top of the machine. 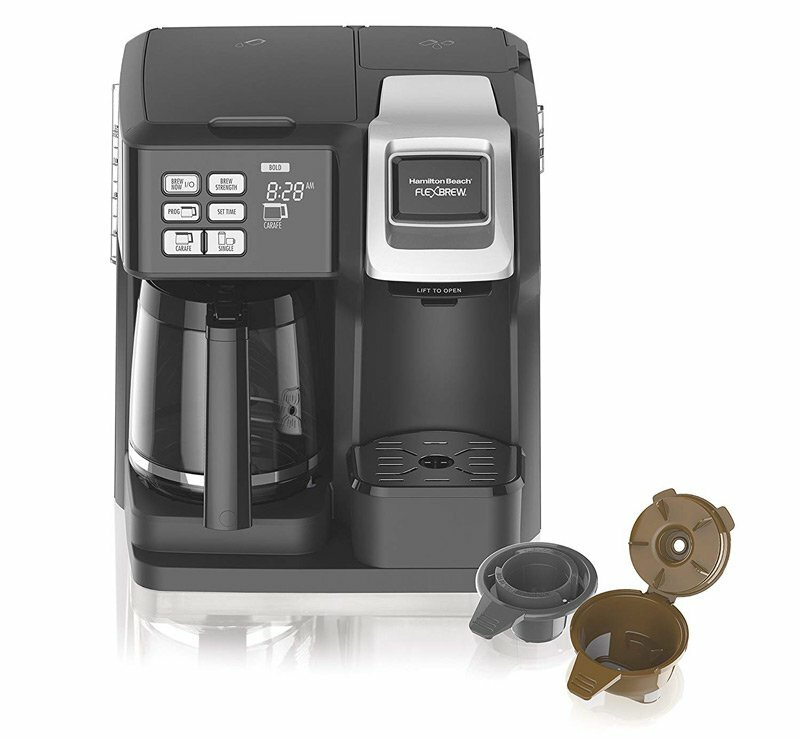 It has several push-button controls that allow you to brew coffee with ease. You can choose to brew simple coffee or specialty coffees. The machine also has a strong setting for double strength coffees and allows you to brew different sized cups such as 6, 8, 10 and 12 oz. It also has a shot function that gives you concentrated coffees for all sorts of specialty beverages. Capabilities – Keurig coffees are available in a magnitude of different flavors. You can get cups for various coffee types and with this coffee maker with its milk frother, there is no coffee type you cannot make. You can use it for casual coffee brewing or set it to create lattes and cappuccinos. The shot function, however, allows you to experiment with your own recipes or to create all sorts of different fine tasting beverages including cold beverages such as iced coffee. Aside fitted milk frother enables you to make delicious warm and fluffy milk with ease and you can, of course, use this milk for either specialty drinks or cooking in the kitchen. Cleaning - The k-Café is pretty easy to keep clean. A removable drip tray can easily be washed and the milk frothing cup is dishwasher safe which allows for easy and quick cleaning. Everyone that buys a coffee machine has to deal with that one issue where you still have to keep the kettle around just for the sake of hot water. You want that occasional cup of tea, need to make some breakfast or occasionally just need a small cup of hot water just for cleaning. 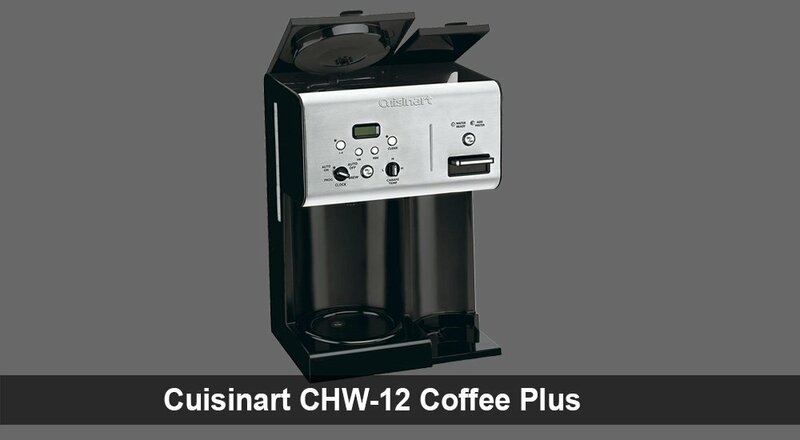 The Cuisinart CHW-12 is the perfect machine to help overcome this issue because it doesn’t just enable you to brew fine tasting coffee, it also has a hot water system that you can use for an infinite amount of other purposes. This is the perfect coffee maker for home use or for offices. It is affordable, simple to use and gives you everything you need for your coffee bar. 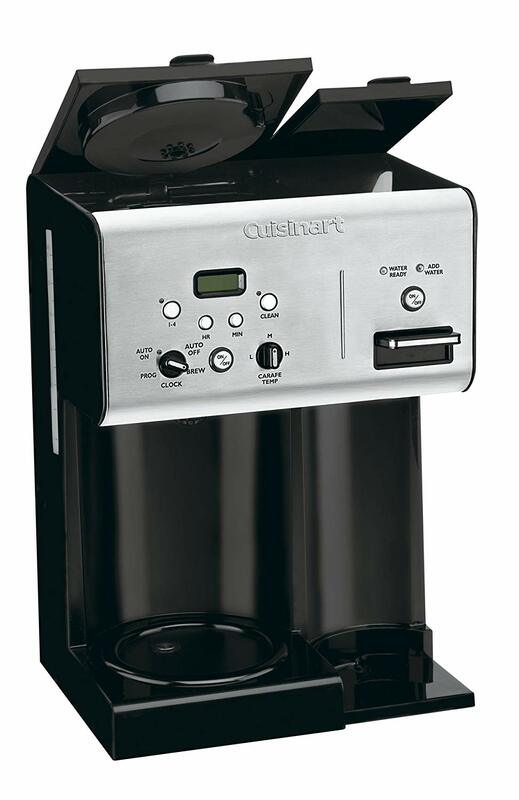 The overall look of the Cuisinart is pretty good. It comes in silver and black, has a compact design and features all the controls you need on the front screen. The compact coffee maker should look terrific in your kitchen or inside any office coffee bar. The Cuisinart has an LED digital time display that makes it easy to see the exact time. It is fully programmable and can be set on auto on, auto off, programmed or on brew function. It has 3 easy to access temperature settings and lights indicate when you need to add water and when the water is ready. The brewing side of this coffee maker has a drip-free sprout and takes a 12 cup carafe. The coffee maker has a 54-ounce water reservoir and is fitted with a temperature control heat plate. A brew pause feature allows you to instantly pour a cup of coffee while brewing and the machine are also fitted with a charcoal water filter and gold tone filter that removes impurities from your beverages. A hot water side gives you instant access to hot water that you can use for a great variety of purposes such as soups, tea, oatmeal, cocoa, instant coffee and more. This machine is pretty easy to clean. It has a removable drip tray and the top lids of the coffee maker make it easy to top up with water or ground coffee or to remove the filter for easy cleaning. This simple yet stylish coffee maker is a terrific investment for anyone who loves great tasting coffee and still want the functionality of hot water around breakfast or lunchtime.